Here we go again. Every once in a while, talk surfaces about technology replacing the need for real estate brokers and agents. Look at Expedia and travel agents people say. Or look at Uber and taxi drivers. Now that Zillow introduced their “Instant Offer” service where investors will offer to buy a home quickly, another round of articles have surfaced about the fate of real estate professionals. Here’s the crux of the issue. There’s a big difference between booking a $10 ride downtown or a $199 airfare compared to the purchase of a $475,000 home. A humungous difference. And Zillow’s “Instant Offer?” We all know how investors act. They buy low and sell high. How many sellers are going to accept their low offers? We will have to see. But if you look at the latest statistics in 2016, about 95% of home sales involved the use of a licensed real estate professional. That percentage has actually increased over the years. The one big flaw is trying to turn homes sales into commodity sales is that homes are far from anything resembling a commodity. Just about every home is different. Every street is different. Every neighborhood is different. That’s just on the seller’s side. When it comes to the buyer’s side, every home buyer is different. They are at different stages in their lives – first time home buyers or retirement home buyers. That are different stages in their family makeup. They are at different stages in their financial situation. The great thing about humans is that they are not made with cookie cutters. We all have different preferences and tastes. One home buyer might love to golf and would never think about sitting on a yoga mat. Another home buyer needs to sit on a yoga mat three times a week and thinks a birdie is that creature in the bird bath in the backyard. Every market is different. Some are hot, some are not. Some have numerous amenities, others don’t. This argument about tech replacing agents is going to continue for decades. One key strategy brokers and agents can use to squash this talk is not to scoff at technology but embrace it. Sure, Mr. or Mrs. Real Estate Agent may still rely on wearing out the tires driving buyers to look at homes or scuffing up the shoes walking people through open houses. But the savvy agents will also be immersed in the latest technology that makes them a better agent and resource for the worried home buyer and home seller. That might include drones and virtual reality videos. And take real estate data for example. Sure, with the web, home buyers can search all over the place for neighborhood information. They can look up crime statistics, school information, and demographics. Or they can turn to national websites. But, how great would it be if the local broker and agent already had that information available on their website? Because here’s a fly in the Internet ointment. There is soooo much information pouring out of the web these days, that it’s difficult to tell what’s credible and what is not. The beauty of the Internet is that it’s an open source of information. Anybody can post relevant content. The bane of the Internet is that it’s an open source of information. Anybody can post content and pretend it’s reliable. Look at all the fake news out there. How many articles have you seen with the fake headline about how “Oprah did this” or “Obama did that.” Fake. Fake. Fake. People don’t have time for fake. If you as a real estate professional, gather up all the relevant information a homeowner might need, then you take away the need for a buyer to conduct their own searches (along with the frustration). In essence, a broker or agent can make it seem like when a consumer visits their office, they are also visiting a gigantic data warehouse of hyper-local information. (However, instead of having banks and banks of high-end servers in a room, an agent would simply load a simple real estate data API with a few lines of code onto on their website. Home Junction would actually gather and manage all that data on their website. It doesn’t get any better than that). Agents and brokers can also embrace the latest geo-spatial technology. Present maps on their website showing property listings from MLS integrated into a neighborhood database. Location is still critical in real estate. Show where the schools are located compared to properties in question. Show the golf courses and the yoga studios as well. Here’s the big flaw in all this talk about the end of the real estate professional. Buying a home, especially in today’s market where prices are booming, is still a big, scary decision. In fact, there is so much real estate content out there that it becomes overwhelming at times. 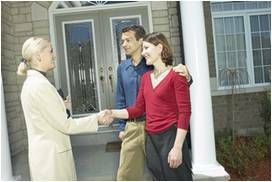 Consumers are still going to need to hold the hand of a dependable real estate broker and agent. The smart agent or broker will have their other hand on their smartphone or laptop, ready to access a wealth of high-tech services such as real estate data feeds that they can provide with confidence and credibility.